Dr Anthony Seymour has run, with friends, to raise money for his son’s school Wairoa, over the past 4 years. Anthony’s son, James, has autism. He has been at the school since 2007. 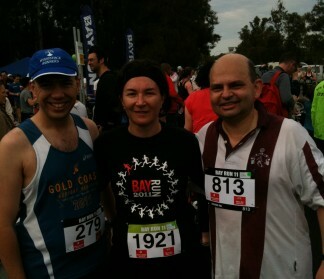 In past years we have run the Harbour Bridge run (9km), the Bay Run (7km). This year Crystal will be running the Cook River Run (10km) on 24th June. Anthony will join her and husband Dave on the Bay Run (5/8/2012). 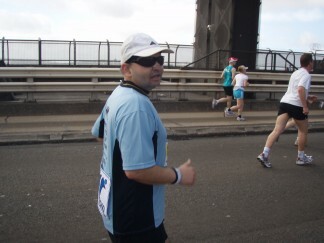 And for the first time, we will run the Harbour Bridge 16/9/2012) run as well, ALL IN ONE YEAR! Wairoa is a NSW Department of Education and Training school providing specialist educational services for students with moderate and severe intellectual disabilities. The school offers placement for students between 4 and 18 years from the eastern and inner west suburbs of Sydney. Wairoa School provides an individualised educational setting utilising a multi-disciplinary team approach involving expertise provided by trained teachers, aides, therapists, counsellors, consultants and other specialised staff, each one committed to meeting the individual needs of each student within a challenging and caring learning environment. It is the aim of this school to provide an educational environment which is secure, stimulating, challenging, safe and happy. The program of education offered by the school is one which is balanced towards the fulfilment of potential, preparing students for integration into community life through the development of life skills. If you or family or friends would like to sponsor us that would be great. Monies can be sent to school by logging on to the website at http://www.everydayhero.com.au/anthony_seymour_5. Or come into the surgery and make a donation. We shall let you know how it goes and have some photos for a future newsletter.